A local community group, Magpie’s Nest Community Art Space, saw my display at Vancouver Mini Maker Faire back in June. They got in touch interested in using the #YASVB project as inspiration to create another series of events. Thus, the Affirmative Art Journaling workshops were devised. 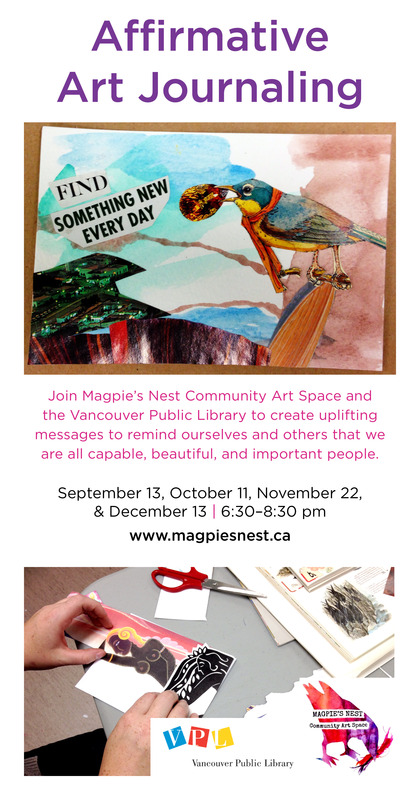 This fall, join Magpie’s Nest Community Art Space and the Vancouver Public Library Hastings Branch to create uplifting messages to remind ourselves and others that we are all capable, beautiful, and important people. Taking inspiration from craftivism and Betsy Greer’s You Are So Beautiful Project, we will be art journaling to help change the messages we see, hear, and tell ourselves. We live in a world surrounded by media, news, and social connections that often leave us feeling empty, unaccomplished, unfulfilled, and not worthy. Every day we have to fight to remember that we are enough just as we are, we are beautiful just as we are. Some days, though, we forget. Art journaling is a creative process for people to record their stories, feelings and ideas—to remind ourselves and others that we are wonderful, exactly as we are. Sessions are free and open to anyone to attend. Materials and supplies will be provided, but participants are welcome to bring their own art journals to work on as well. If you’re new to art journaling, don’t worry, we’ll do a little primer and have some examples to show. You’re free to do what you’d like with your finished items—keep them as personal reminders, give them to a friend, leave them out in the world, or leave them behind with us. There will be 4 sessions this fall: September 13, October 11, November 22, & December 13, from 6:30–8:30 pm at VPL Hastings Branch.